A father has been left paralysed from the hip up after falling downstairs - while sleepwalking. 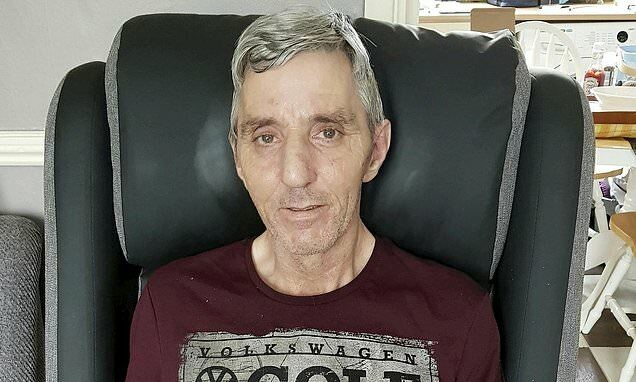 After former caretaker Colin White, 56, went to bed with his wife, Jo he woke up on the floor at the bottom of his staircase unable to move and with searing pain running through his body. The fall left Colin with tetraplegia which restricts movement of the limbs and he is now in need of constant care and assistance. Nursing assistance Jo, 55, said: 'Our lives have changed completely. 'It was like he has just stepped into darkness. 'He went to bed as normal, we were talking a bit in bed and then we went to sleep. 'And all of a sudden I heard this thud, it was around three or four in the morning. 'I thought he had gone to the toilet but when I got up to look I just saw him in a heap at the bottom of the stairs. Doctors say the father-of-one has damaged his spinal cord in the accident. Jo says her husband, who would 'regularly sleepwalk', cannot remember falling down the stairs which is why doctors and his family believe he was sleep walking. She adds: 'He would regularly sleepwalk before this but he would normally make enough noise for me to wake up and bring him back to bed. 'When he fell all he kept saying was 'where am I' because he just didn't know where he was - it put him into darkness.